It is tax season and the common misconception is that getting a tax refund is a good thing. As per the New York Times, “Americans generally prefer to have too much withheld … Typically, three-quarters of tax filers receive refunds — including last year , when more than 102 million tax filers got money back.” Here is why you need to rewire your thinking and start dreading a tax refund. A tax refund means that you prepaid more taxes than you owe. 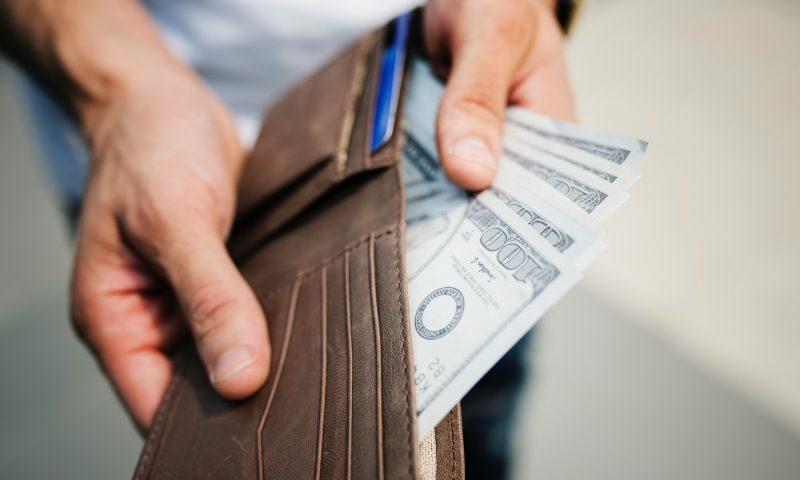 Withholding means that money is sent directly from your paycheck, or in the form of estimated payments, to the federal and state government to pay a portion of your tax bill. In a perfect world, you want your withholding to be exactly the same as the amount of taxes you owe. Getting a refund is a bad deal financially. You are giving away your money as a free loan to the government. When you get a refund, the government is essentially giving you back money that you have loaned them. Also, they do not pay you any interest on this loan. When you overpay your taxes, you lose out on the opportunity to keep the money that is yours and grow it throughout the year. Do you really want to be loaning the government your money and get no interest in doing it? They keep your money until you file your taxes. You can not get your money back until you file your taxes, proving you are owed a refund, and they deposit or send you a check. You could be waiting over a year to get your money back. The IRS and states assume that you are sending them the right amount until you let them know with your tax return. You could have used this money all year. We have been wired to think that getting a refund is getting free money, but it is not. The refund you get is your money, and you should have had in your pocket all year to save, spend or invest. Don’t Expect an Excessive Tax Refund for 2018. This year with the promised “tax cuts” to most of the middle class; many individuals are assuming they will be getting a large refund. What wasn’t publicized is that you most likely have been receiving this “tax benefit” all year long, as paycheck withholding rates were updated to match the new tax brackets. So, you effectively have been receiving your tax benefits all year in the form of more money in each paycheck. Therefore, don’t expect a large refund when you go to file. Make sure your withholding is correct. 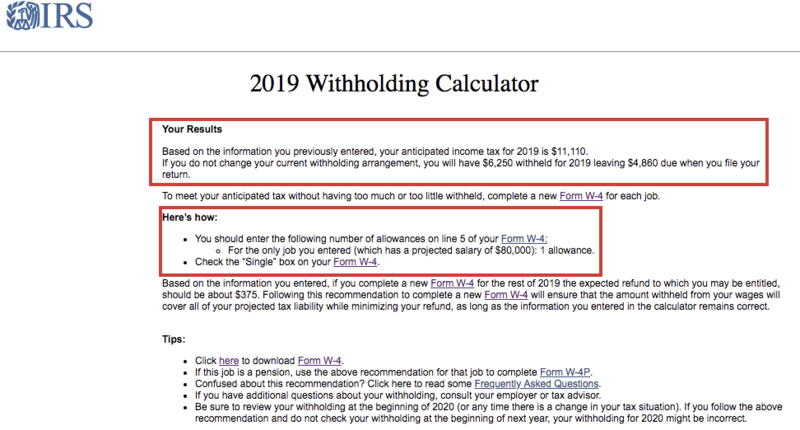 Follow the easy instructions on the withholding calculator to estimate your tax liability for 2019 and get tips on how to fill out your W-4. (See my example below.) You will need to have a paycheck handy to fill out this calculator. Based on the results of the calculator, use form W-4 to update your withholdings. In the example I did above, you can see that I should fill out a W-4 as “single” and with “1 allowance”. If you feel overwhelmed, confused or your situation is more complicated than what the calculator can handle, contact a tax preparer. A tax preparer (CPA or EA) can run a tax projection for you and help you plan your withholdings and tax strategies to implement for 2019 and beyond. The opposite end of the spectrum has consequences as well. You will be subject to penalties and fees if you do not withhold enough taxes from your pay. You are required to have “paid withholding and estimated tax of at least 90% of the tax for the current year or 100% of the tax shown on the return for the prior year, whichever is smaller” to not get hit with a penalty. The rules are different if you earned a very high income or are in specialty fields of work. You can determine how much you will owe in penalties and fees by using form 2210. For the average taxpayer, the withholding rates do a good job. If you have a second job, get untaxed bonuses, are self-employed, have large deductions, etc. your actual tax bill could differ significantly from the standard withholding tables. When life changes your W-4 should change. Don’t forget that when you get married or have children, you should also review and update your W-4. Check your withholdings each year to make sure you will not have a surprise refund or a substantial underpayment penalty. Tax refunds are not a good thing and are not free money. Rewire your thinking. Keep your withholdings accurate and updated to make sure that you are on track to only pay the taxes you will actually owe. Get help from a tax preparer or fee-only financial planner if you need help.